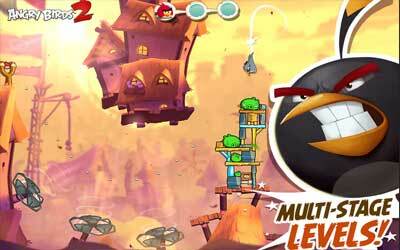 The latest Angry Birds 2 2.3.0 APK has been released by Rovio. They bring great game, with many fans and very popular in the previous sequel I think this version will get many users too. Still with the same gameplay concept, in this game you will return to play catapults with the birds as bullet character. Each birds have different strengths, such as Red can emit puff of air, Chuck can dip sharply, the Blues were able to break itself up into three, etc. It is not just support or power-ups in the game, you just have to think the best strategy: character of birds that should be used on the first shot, the second, and so on. Unlike the predecessor game where the birds already lined up behind a catapult, the sequence to be used has been determined by the game. Whereas in Angry Birds 2, the birds and the spell is packaged in the form of cards and we could choose which card you want to use first. If the card is exhausted but not all the green pigs defeated, then you fail and no restart feature as in other Angry Birds game series. This second sequel feels more serious, though not fit into the category of mid-core game, but this game feels a little complex when categorized as a casual games. Because, now at every level there is not just one location that you will meet, at least two locations bad piggies who should succeed you beat. Then this is closely related to the number of cards you still have, whether it can be sufficient to complete the level or not. 20 brand new levels and more to come! I have played angry birds that quite boring angry birds 2 is very easy to play and many levels to play the levels like a candy crush saga you must have this game.